Cellulite is the bane of so many people’s lives and haven’t we all tried everything to get it gone? Avon’s newest product SMOOTH MOVES anti-cellulite cooling gel could be the answer you’re looking for. You will feel it working instantly and it quickly targets it for visibly smoother skin and improved texture. 98% saw improvement in just 4 weeks, dramatically reducing the look of even the most persistent problem. L-carnitine & Chai Hu target fat cells, reducing the look of cellulite. The tube is 6.7 fluid ounces and the regular price will be $18.99. Now on sale for $12.99 and you can mix or match two for $20 on certain pages in the Campaign 4 brochure. Tired of sagging skin getting you down? 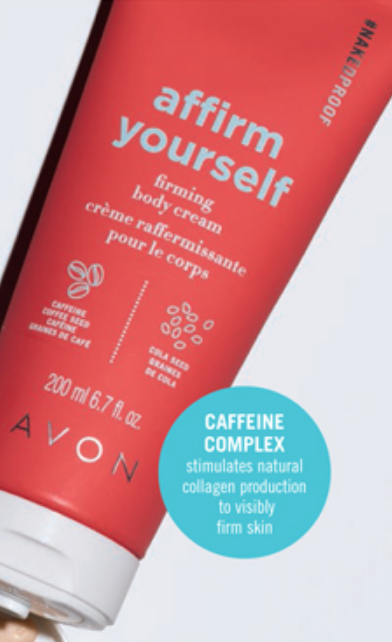 Stand firm with Avon’s new AFFIRM YOURSELF firming body cream. It is clinically proven to visibly banish crepey skin! See a more toned, defined look. 96% showed improvement in firmness and tone of their abdomen and hip area. Tube is 6.7 fluid ounces is regularly $18.00 now just $12.99 with the mix and match special for this as well. Tired of seeing those stretch marks? Stop them in their tracks with the new END OF THE LINE stretch mark minimizing lotion from Avon. Instantly stretch marks are visibly diffused and in two weeks dramatically reduces the appearance of stretch marks. With shea butter and pomegranate extract it stimulates natural elastin production for visibly reduced stretch marks. Also visibly improves skin elasticity and suppleness. The 6.7 fluid ounce tube is regularly $18.00 now just $12.99 with the mix and match special of two for $20.00 in Campaign 4. 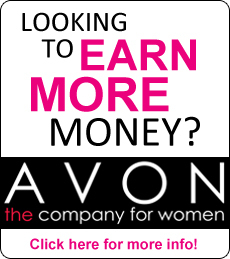 So whether it’s cellulite, crepey skin, stretch marks or all three, Avon has you covered.